How businesses are organised - Tescos and a Technology College. ﻿How businesses are organised? 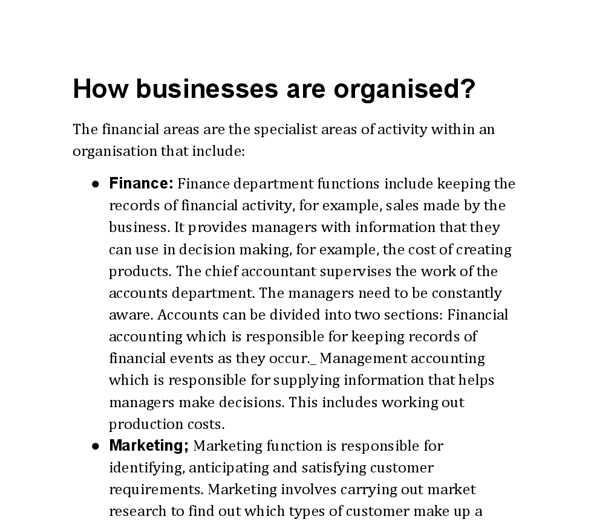 The financial areas are the specialist areas of activity within an organisation that include: * Finance: Finance department functions include keeping the records of financial activity, for example, sales made by the business. It provides managers with information that they can use in decision making, for example, the cost of creating products. The chief accountant supervises the work of the accounts department. The managers need to be constantly aware. 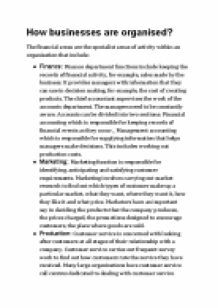 Accounts can be divided into two sections: Financial accounting which is responsible for keeping records of financial events as they occur._ Management accounting which is responsible for supplying information that helps managers make decisions. This includes working out production costs. * Marketing; Marketing function is responsible for identifying, anticipating and satisfying customer requirements. Marketing involves carrying out market research to find out which types of customer make up a particular market, what they want, where they want it, how they like it and what price. Marketers have an important say in deciding the products that the company produces, the prices charged, the promotions designed to encourage customers, the place where goods are sold. ...read more. The customer service of Tesco carries out surveys and works out to find out how the customers rate the service of Tesco. If the customers have any issue they report at the customer service in Tesco and the customer service department solves their problems out. If anyone has any loss or if they thing the product is damaged they report the customer service and the customer service sorts their problems out. If there is any damage by the customer that is even handled by the customer service and they have to deal with it. Sales: The sales department of Tesco is responsible for customers to buy what they have produced. The sales department finds out the needs of the customer and the latest trends going on. The sales department figure out at what price the customers feel easy to buy their product or if there is any market recession going on or if there is increase in unemployment. The sales department gets the customers to buy what Tesco has produced. The sales department of Tesco creates orders for goods and services. Tesco advertises its goods and has a small sales team. ...read more. Washwood heath Technology College has welfare role and it looks after people and their needs, if they are happy with the course. Washwood heath Technology College has supportive role which helps them recruit new staff teachers. The administrative role pays wages to the staff members and has health and safety requirements. Educational and development role helps the teachers train and develop the staff in the school. Organisational structure: Head teacher: The head teacher controls all the affairs of the business and looks after the whole school. Vice principal: He or she assists the head teacher and helps him with his work. * Reception: the place where all the affairs of school are handled or where all the main information is taken from. * Staff members: this includes the teachers as well; they help in the activity of the school. * Human resources department * Construction department : civil engineering, metal engineering and electro-mechanical engineering * Financial affairs department * Examination department: this is where all the activities related to exams are taken place. Purpose of structure: The purpose of structure for washwood heath Technology College is to provide education. It tries its best to provide the children with the best education. Their aim is not to make profit as that is handled by the government. ...read more. For instance Tesco may be able to identify a product not selling very well within a 2-3 day period and offer a promotion to encourage the sale of this item. It may also help them to notice slumps in average spending or identify other interesting trends. * By customer - where different customer groups have different needs. * By process - where products have to go through stages as they are made this means they are in different levels done gradually, one step at a time. also shows the importance of the economic environment which could drastically affect other businesses such as Tesco. It Is important to keep the economic sustainable for example if there is excess growth there this will cause thing such as taxes to raise up and businesses to raise up the prices of their products. Some consumers now rather buy their product directly from these farm shops then going to their usual supermarkets. This is what drove most retailers to increase the amount of fresh food and dietary food in their stores to make sure they satisfy the needs of the consumers and to adapt to these changes. D1: Analyse how developments in the consumer market have impacted on Tescos.